Westwood Gallery NYC presents a premiere gallery exhibition of 49 original drawings by Andy Warhol. 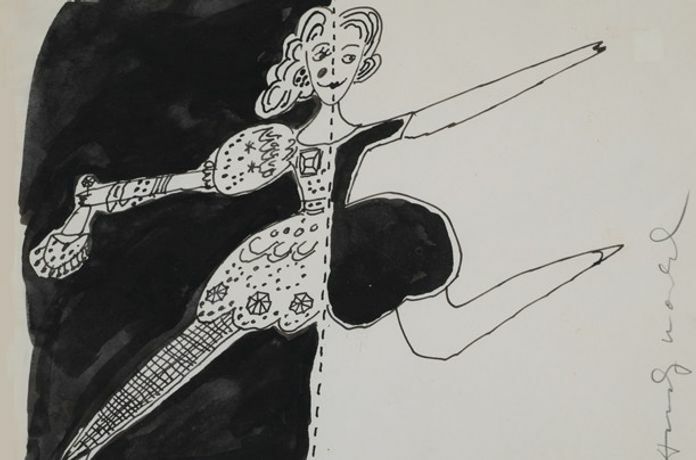 The free form ink drawings from 1955 to 1967 are a reflection of Warhol’s fascination with the performing arts during his rise from commercial artist to the launch of his fame as a global Pop artist. Andy Warhol arrived in New York City in 1949 at the age of 21 after graduating from Carnegie Institute of Technology. While at Carnegie he developed interests in dance and performing arts and enrolled in a modern dance class where he was the only male student. In New York City the 1950’s were a golden post-war era of magazines, advertising and consumerism. Warhol was one of the most successful commercial artists, creating sought-after drawing illustrations for shoes, flowers and happy promotional images. Although he yearned to be in the circle of fine art artists in New York and focus on experimentation with various art media, he began to meet people of interest in the cultural milieu in Manhattan. Warhol attended performing arts, theater, ballet, concerts and counterculture events. Warhol met Lydia Joel in the early 1950's at a dance concert, she was Editor-in-Chief of Dance magazine from 1952-69. Lydia Joel was later portrayed by Debbie Allen in the movie Fame (Lydia was also the head of the dance department at the School of Performing Arts, 1973-84). Associate editor Doris Hering answered the door upon Warhol's first visit in 1951 and saw a person she described as "a pathetic little thing." Through 1967 Warhol called upon Lydia, meeting her at the magazine office, to converse on contemporary dance and performance. He gifted a drawing to her at most of their meetings as a token of appreciation for her commitment to the arts. After viewing Warhol's artwork, Lydia selected or requested several drawings for Dance magazine, such as a cover portrait of a ballerina en pointe in 1958 and another cover of the late dancer, Doris Humphrey in 1959. In June 2007, Dance Magazine reprinted some of the Warhol drawings in an article to celebrate their 80th year in publication. Lydia Joel died in 1992 and a private collector acquired the entire collection of her Warhol drawings.